We pray for it, we slave for it, we devote our best years and finest talents to acquire it. And then we blame it for all our ills. a) It has usurped the position — once occupied by the spiritual, the transcendent and the divine — of the highest striving of man and the ultimate authority in his life. In this day and age, the dollar is god. b) It is the cause of untold division and strife. It has pitted brother against brother, neighbor against neighbor, nation against nation. Indeed, virtually all conflicts are conflicts between the haves and the have-nots. And what do the haves have that the have-nots do not? Money. But is the dollar really at fault? Is a six-and-one-eighth by two-and-five-eighths inch piece of green and white paper to be blamed for the fact that we have transformed the ultimate means into an ultimate end? That a most potent social glue is used to build walls of hostility and fortresses of isolation? What does the dollar itself say about its intended and perverted uses? 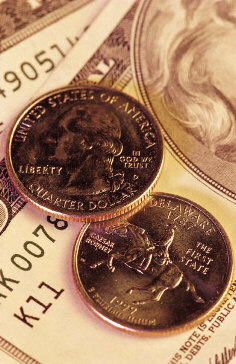 By divine providence, the designers of the dollar inscribed on it two key phrases. The first, which extends above the large ONE on its reverse side, is "In G‑d we trust." Not I, says the dollar, can provide you with solace from the pain of life and security against its uncertainties; not I should serve as the object of your yearning and the focus of your striving. Do not trust in me—trust in G‑d. Do not serve me—use me to serve G‑d. We all know what it does, but what does it say? The second phrase, inscribed on the face of the Great Seal of the United States reproduced to the right, is E pluribus unum (Out of many, one). Yes, the world we perceive with our eyes of flesh is a plural world, a world of great variety and diversity. But our mission in life is to make of the many one, to unite these diverse forces into a harmonious expression of the oneness of their Creator. People are different — differently endowed with talents, resources and opportunities. Money can deepen these differences, when it is used to hoard wealth, reward privilege and exploit the needy. But money is far more suited to unite and equalize. It is the ultimate abstractor, converting goods, talent and toil into a commodity that can easily be traded and shared. It is a medium of generosity and cooperation between men and nations, a consolidator of resources to a common end. The next time you use or pursue a dollar, take a moment to read the fine print. Based on the talks and writings of the Lubavitcher Rebbe, Rabbi Menachem M. Schneerson; rendered by Yanki Tauber. Is It Good to Be Rich? The Dollar In my opinion, Yanki Tauber says it very well.. Money is like the life that in blood, it should bring life to others and not choke off the life of others. "It is a medium of generosity and cooperation between men and nations, a consolidator of resources to a common end."